Solar Powered Handheld Nintendo Emulator | OhGizmo! What’s this? A third-party handheld Nintendo emulator that doesn’t look like a piece of crap? I’m shocked! Of course while the name, Solar MP4, seems to keep with the tradition of crappy knock-offs, this little device actually has some impressive features. Besides being able to play MP4 videos up to 320×240 in size on its 3.5 inch TFT screen, it also has built-in emulators for NES, GameBoy and GameBoy Color games. It of course requires you to use ROMS loaded via an SD card, but anyone already interested in classic gaming emulation will know where to find those. It can even function as an e-Book reader with the ability to read aloud any text file as long as it’s written in English or Chinese. 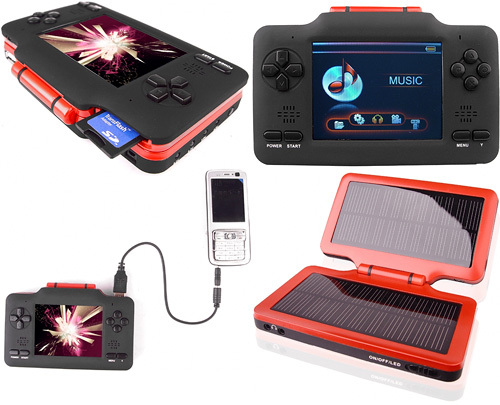 The other obvious feature of the Solar MP4 is the clamshell design which opens to reveal a set of solar panels. Not only can they be used to charge the unit itself (they claim you’ll never need to plug it in) but a USB jack allows you to plug in and recharge other devices too. Chinavision has it for $123.32, but it’s one of those ‘the more you buy, the cheaper it gets’ schemes. IS it still Nintendo DS? I did not recognize it.